Beluga whales lack dorsal fins to allow them to swim under the ice. Belugas are small, toothed whales. They are gray when they are born and turn white as they age. They have very muscular, robust bodies and large melons, bulbous structures on the forehead. Their neck is very flexible, and, in place of a dorsal fin, they have a ridge running down their back. Beluga whales have a very thick blubber layer that can be up to 5 inches thick. Belugas are about 5 feet long at birth and weigh 90–130 pounds. Adults grow to be 11–15 feet long. Females are smaller than males, rarely growing over 12 feet. Reports of adult beluga weights vary from 1000–3300 pounds. Belugas generally give birth to one calf every 3 years. Female belugas mature at 8–10 years of age. Males mature slightly later. Breeding occurs in the spring, and gestation lasts approximately 14 months. Calves are born in the summer, and mothers nurse their calves for 2 years. Belugas molt each summer. They travel to shallow areas and rub their bodies against the bottom to help remove the old skin. During molting, skin grows about 100 times faster than normal. Belugas are generally considered to be opportunistic feeders. Fish species make up a large part of their diet including herring, capelin, smelt, cod, salmon, flatfish, sculpin, lingcod, and eulachon. They will also feed on octopus, squid, shrimp, crab, clams, mussels, snails, and sandworms. Feeding occurs over the continental shelf, in nearshore estuaries, and in river mouths. Most feeding dives are fairly shallow and last 2–5 minutes. However, belugas are capable of diving to depths exceeding 2800 feet. In the northern extent of their range, belugas forage under sea ice that may cover 90–100% of the surface. They have been documented to travel under the ice up to 430 miles from open water. Belugas are social animals and generally travel in small pods. However, pods of over 1000 individuals have been documented. The pods do not seem to have a fixed structure. It is common for individuals to move between pods. Adult males often travel together, and females with juveniles generally form separate pods. When travelling in pods, belugas frequently surface simultaneously to breathe. Belugas also practice a breathing technique known as “snorkeling” when only their blowhole breaks the surface to breathe. Only 4–7% of their time is spent at the surface. Beluga whales have sensitive hearing and well-developed echolocation capabilities. They also make a larger range of sounds than any other marine mammals. Their vocalizations include grunts, clicks, chirps, and whistles. These sounds are used to communicate, hunt, and navigate. Belugas are capable of migrating long distances. Belugas from the Bering Sea migrate over 1500 miles to the Mackenzie River delta in Canada. They have also been known to travel up rivers. In the 1980s, one beluga was documented 830 miles up the Yukon River. 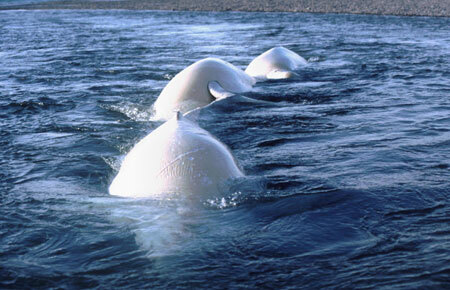 Though they are capable of long distance migrations, belugas’ migrations are generally localized. Beluga whales inhabit arctic and subarctic waters in the United States, Canada, Greenland, and Russia. They are found in open ocean, continental shelf, coastal, estuary, and river waters. Within Alaska, there are five different populations of beluga whales: Cook Inlet, Bristol Bay, eastern Bering Sea, eastern Chukchi Sea, and Beaufort Sea. The Bristol Bay and Cook Inlet populations are believed to remain within their respective areas year round. The eastern Bering Sea, eastern Chukchi Sea, and Beaufort Sea populations winter in the Bering Sea and return to their respective areas during the summer. The Beaufort Sea, eastern Chukchi Sea, eastern Bering Sea, and Bristol Bay populations are considered healthy and stable. In October 2008, the Cook Inlet beluga population was classified as endangered under the Endangered Species Act. To learn more, visit the ADF&G Special Status page for Cook Inlet beluga whale. The Bristol Bay and eastern Beaufort Sea populations are stable or increasing. There is no evidence of a decline in the eastern Chukchi Sea population. There is not enough information on the eastern Bering Sea population to create an accurate trend analysis. The Cook Inlet beluga population declined by over 50% between 1994 and 1998. The population seems to have stabilized at this low abundance. Potential threats to beluga whales include hunting, interaction with fisheries, stranding, entrapment in sea ice, predation, underwater noise pollution, contaminants, and climate change. 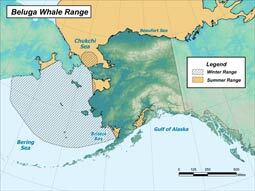 Alaska Natives hunt belugas as part of their subsistence culture. Beluga whales have a low reproductive rate and mature later in life. Therefore, this species does not have high productivity, limiting the amount of whales that can be taken from the population without negative effects and increasing the time required to recover from a population decline. It is important to monitor subsistence harvest to ensure that it does not exceed sustainable levels. Entanglement in gillnets can be a substantial cause of mortality in some localized areas. There is also concern that belugas may be competing with fisheries for their prey species. Strandings are another potential source of mortality for beluga whales. Within estuaries, belugas sometimes become stranded on tidal flats when tides retreat quickly. In Cook Inlet, strandings on tidal flats have been documented. Mortality from these events is generally low, but larger whales are more likely to die in these situations than smaller whales. Belugas may also become trapped in sea ice. This generally occurs when strong winds or sudden cold periods close the leads and cracks in the sea ice that belugas use. Then large groups may become trapped in small openings in the ice when open water is further than they could swim in one breath. Beluga whales fall prey to orcas and polar bears. Orca attacks on belugas have been documented in Cook Inlet, Bristol Bay, and Hooper Bay. Belugas have been observed moving into shallow water or areas covered with sea ice to avoid orcas. Polar bears can take belugas when they are trapped in sea ice. The bears will wait for the whales to surface to breathe then pull them from the water. Belugas rely on the use of sound to communicate, navigate, and find prey. High levels of human-generated noise may interfere with their ability to carry out these functions. There has been no evidence to imply that Alaska belugas are suffering from high contaminant load. However, belugas occupy a high level of the food chain increasing their risk of concentrating toxins. As populations continue to grow and coastlines are developed, it will be important to continue to monitor pollutants in belugas. Belugas are also susceptible to catastrophic toxic events such as an oil spill. The effects of climate change on belugas remain unknown but could negatively impact the species directly or indirectly by changing their environment, changing the range of their predators, or affecting their food.